What is not to love about Larkspur? The pastel shades of old-fashioned flowers are enough to make any non-gardener a believer. Larkspur stands out among the crowd, and enjoys the attention she receives in the Spring garden. Larkspur blooms continuously month after month, until the hot sun settles in. Honestly, Larkspur is just about the perfect addition to any garden. I obtained my Larkspur seeds from a friend many moons ago. Each year, I am reminded of my dear friend as I have a stunning display of purple love growing casually throughout the garden. Larkspur will self sow, which is an intrical component of the cottage garden, letting nature chose her course. The dried seed pods are available to be collected to share with your friends. I actually like to give flower seeds as Christmas gifts. Larkspur is also a favorite Springtime cut flower. The vase life for Larkspur is well over a week…..just be sure to change the water daily. The beautiful pastel spires of Larkspur are a great compliment to Daffodil and Rose bouquets. To sow Larkspur seeds, simply toss seeds out in the Fall. Larkspur prefers to ‘over-winter’, a gardening term which means the little seedling will grow a strong tap root in the winter, while the actual plant stays small. It is important to sow the seeds in September or October to develop the tap root, which will help the plant thrive during it’s flowering season. I’ve been told Larkspur is toxic to cattle. I don’t know if this is true or not, but if you own cows, it wouldn’t hurt to do a little research. Sold yet? 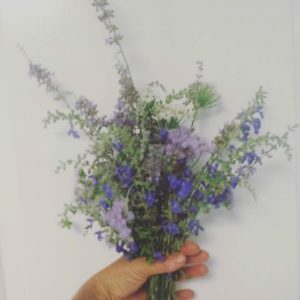 If not, I have *free* Larkspur seeds at the end of the Spring season for anyone who would like to take a chance. The Garden Helpers collect seeds each year, and we send out seeds with every bulb order…..while supplies last. Email heirloombulbgirl@gmail.com for more info and/or bulb orders. If you are in the Texas Hill Country area, come see me…..I am always in the mood to share some bulbs! Happy Gardening, my friends. Plant your dreams and weed your gardens. It’s going to be a gorgeous Larkspur-loving day!